Have you been obsessed with kale for years and now want something new? Try the latest trendy green superfood, Brussels sprouts! 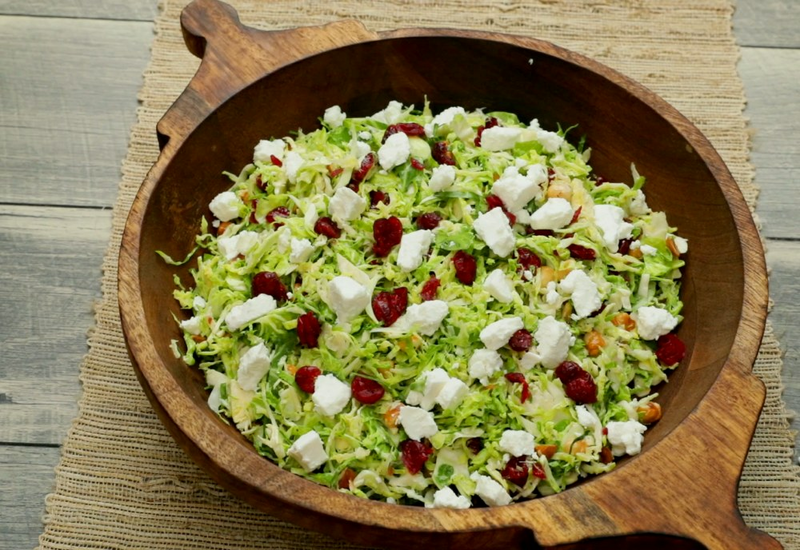 In this recipe, shredded Brussels Sprouts makes a flavorful base for a salad featuring hazelnuts and dried cranberries with a quick and easy homemade vinaigrette. The sweet maple syrup balanced with the zing of white vinegar and creaminess of mayonnaise or yogurt make for a beautiful dressing for this unique salad. If you keep the end on the Brussels sprouts you will have something to hold on to while slicing thinly. This will keep your fingers safe! Per Serving: 218 calories; 14g fat; 19.2g carbohydrates; 8g protein; 9mg cholesterol; 319mg sodium. i used half shredded kale, half brussels sprouts and it was wonderful. i also used feta instead of goat cheese and the salty punch was great. This shaved Brussels sprouts salad is delicious and nutritious! I really loved the toasted hazelnuts! The simple dressing is also very good, the maple syrup gives it a great flavor. I'm on a Brussels sprouts kick right now, so I tried this recipe and loved it. I used blue cheese crumbles instead of goat cheese because that's what I had on hand. This dish makes me want to use shaved sprouts for everything now! If you like Brussels, try this, you will love it! My wife loves Brussels sprouts so I made this salad for her and she loved it. I actually enjoyed it myself, I thought that the cranberries and hazlenuts added a nice flavor to the earthiness of the sprouts. The homemade dressing was also very easy and delicious. Instead of goat cheese I used fresh, crumbled blue cheese on top of this salad. This was super simple to make, especially if you have a food processor, it's quick and easy to shave the Brussels sprouts.